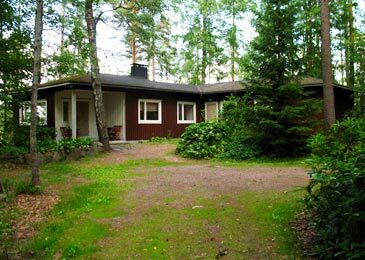 The villa was built in 1950, fully renovated in 1990 and has been refurbished as necessary. 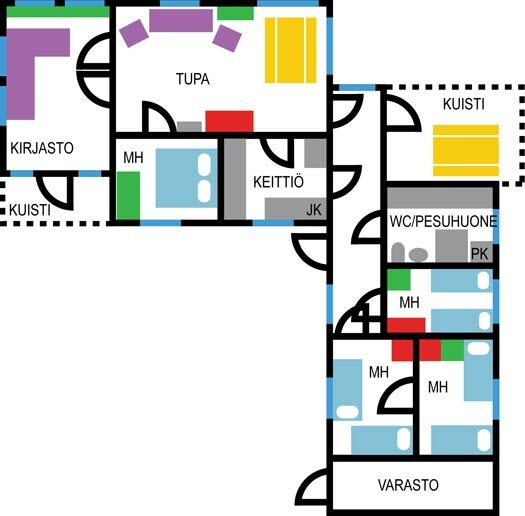 The Mäntyniemi villa is shaped like the letter "L". It is also extremely convenient for two families. You can reach the courtyard easily by car. There are two porches, the other is by the riverside and the other on the southside. Paths lead from the villa to the sauna, grill and barn. Numbers of persons: 8+4 persons. Facilities and equipment: 4 bedrooms, kitchen, library, living room, shower, toilet, electricity, electric heating, electric fridge-freezer, electric stove and oven, dishwasher, microwave oven, electric kettle, TV, DVD-player, radio/CD-player, fireplace/heater, water from drilled well.